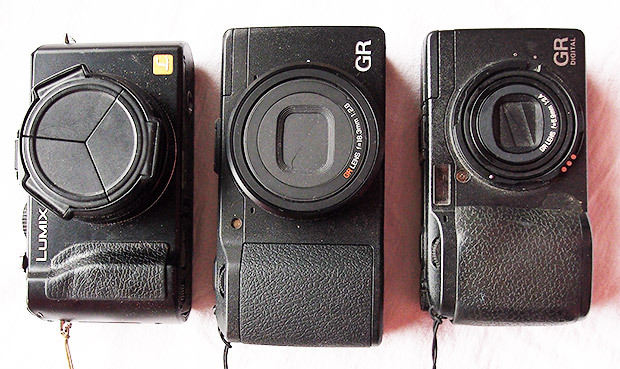 Ahead of our full review of the new Ricoh GR enthusiast camera, I thought I’d post up some comparison photos between the very first Ricoh GR Digital camera (released in 2005) and the very latest GR V model to hit the shelves. Many reviewers had commented that the new camera – which packs in an impressive APS-C-sized sensor – was more or less the size as its predecessors, but I’m guessing the size has slowly crept up over the years because it’s clearly a substantially bigger camera. The photos are a bit rough and ready (sorry! 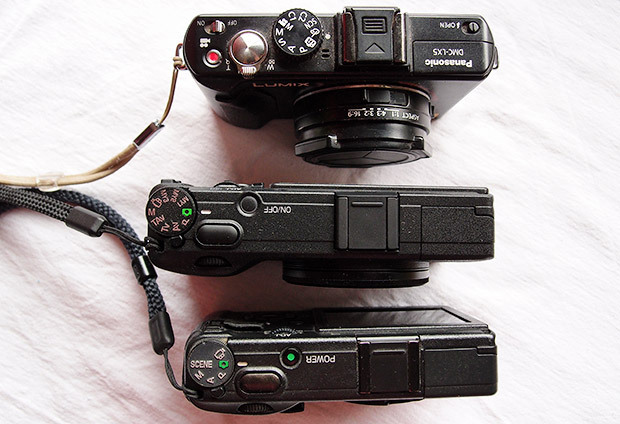 ), but hopefully will still prove a useful guide for anyone considering buying the new Ricoh GR. Here’s the old and new GR’s, back to back. 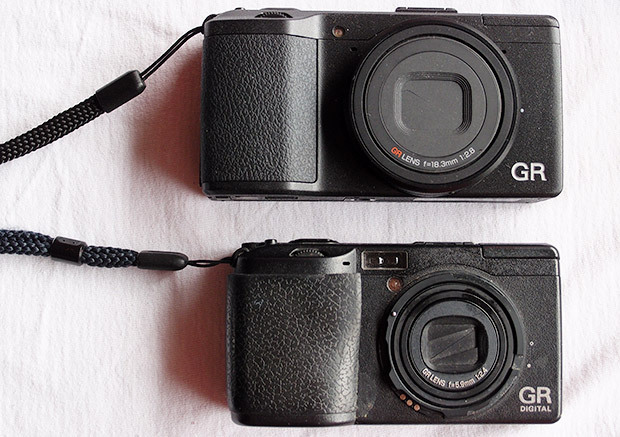 The new GR is clearly a fair bit longer and a bit wider too, although still pocketable, and both seem as tough as old boots. 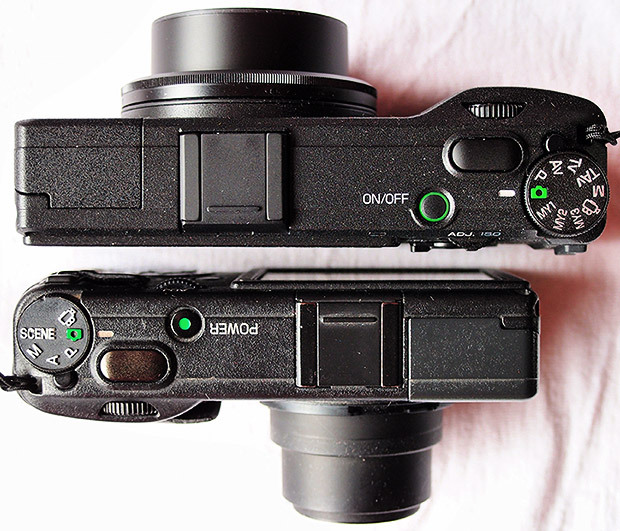 Here’s a comparison with the Lumix LX5 camera added to the mix. Although it’s the shortest of the three cameras, it’s a lot deeper and you’d need pretty big pockets to fit the camera in because of the lens (which doesn’t retract into the body). Another view showing the depth of each camera. 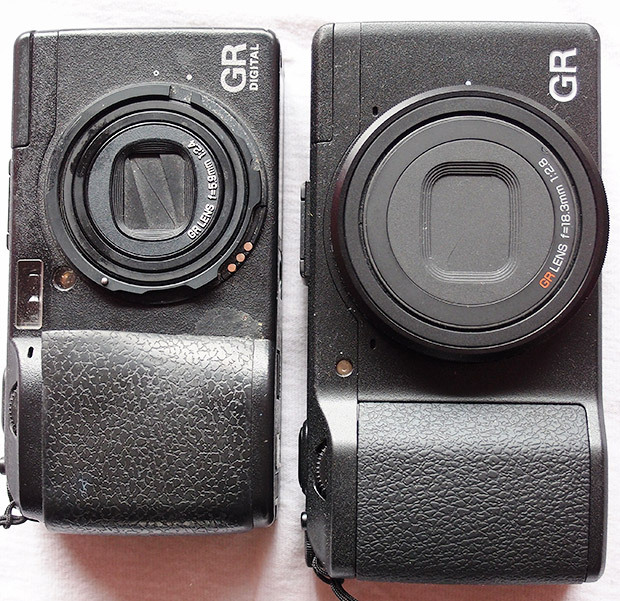 Front view showing our well-used original GR compared to the latest version. 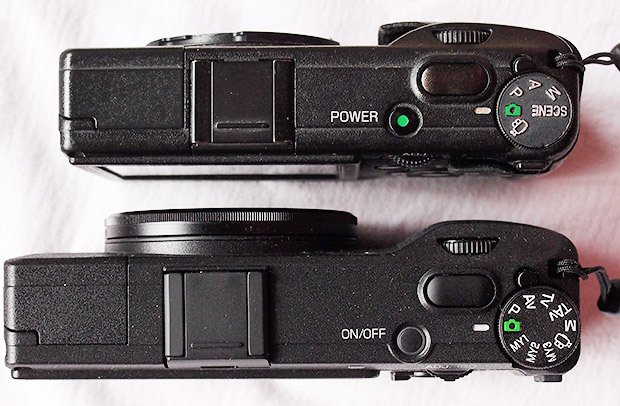 Eight years separate these two cameras (see my 2006 review here) and although they may still look similar, inside the new camera has a substantially bigger sensor. Front view. The lens ring for the old GR rolled off into the distance a long time ago. A final overhead view of the two cameras. Expect our full review soon.